It has been raining for what seems like months. When it's not raining the temperature has been in the 90's and humid. I think we have had enough rain for the entire year just since May. While this would normally be a minor annoyance, my plants are really less than happy. I found mushrooms growing in my basil pot and the lower leaves are turning yellow. There has just been way too much rain, even with great drainage etc they just aren't happy right now. Since the rain is wrecking havoc on my potted plants I have been making an attempt to use as many of my herbs as I can while they are still doing decent. This week I came up with a new recipe for Lemon Balm Iced Tea. Wash and hand crush the lemon balm leaves. Add the lemon balm to 8 cups of water. Bring to a boil and let simmer for 5 minutes. Take off of heat, add the tea bags and sliced lemon. Place a lid on the pot and let sit for 10 minutes. Strain the tea and add to a gallon pitcher. Add cold water to fill and let sit in the fridge until cool. Serve over ice. That's it, a very easy recipe that is refreshing on a hot summer day. My two boys really loved the lemon flavor of this tea and drank the majority of the pitcher. It really is a great way to use lemon balm! I don't like too much rain either! :) What a great way to use up the herbs when they are still great. This iced tea is the perfect way to cool down. Iced tea is a great way to cool down, I agree! We are supposed to have nice weather here today too :) I hope! Lots of rain here, too, but we finally cleared up on Tuesday and so far, so good. There's nothing like some lemon ice tea when its hot and unfortunately it's really hot here. We would love to have the rain that you're having. We even had our 4th July fireworks cancelled because of the lack of rain and we've had all those fires so we're trying to be safe. Have a great weekend! Looks delicious and refreshing especially in this crazy nyc heat and humidity! It really is refreshing, especially in the heat! I need to show this to my friend. She's a HUGE fan of iced tea. We are having the same weather here in North Florida. My summer garden is finished (sigh) it cannot handle the rain. beautiful iced tea drink...Nice to sit on the porch and watch the rain with a glass in hand. Sorry about your garden! This would be great to sit on the porch and sip! It really is thirst quenching! I wish we were getting more rain. Lots of overcast skies, but only a few drizzles here and there. Thanks for coming to Foodie Friday! Thanks for hosting :) I would gladly share our thunderstorms! Just hot and humid now here in NY but we have had plenty of rain. 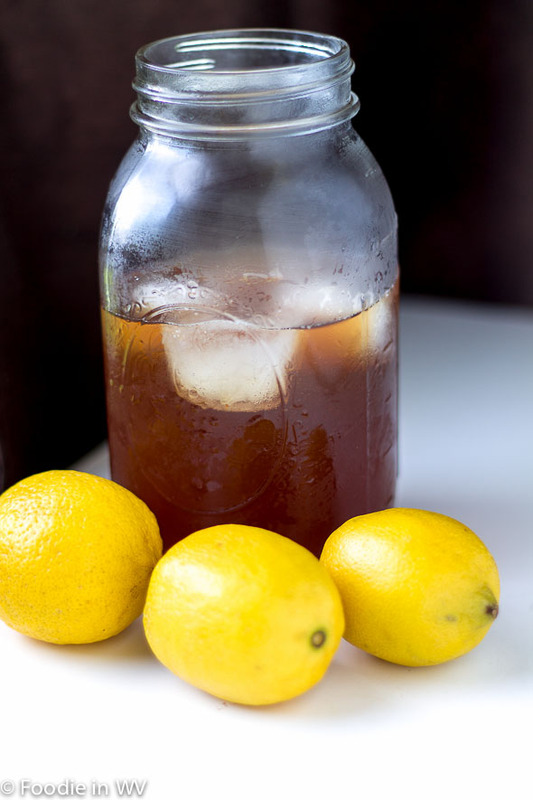 I can go for a mason jar of this tea right now. I'm a big fan of iced tea too :) If you try it tell me how it turns out! Oh my we are hot too... can you get to the mountains. I just escaped this last weekend to the Adirondacks. Great tea I'll be sipping mine too. Thanks for sharing it on foodie friday. Thanks for hosting :) We are going to the mountains to visit my inlaws in a couple of weeks! interesting...i had to google lemon balm! says it's of the mint family, but smells like lemon? i love lemon tea. It doesn't taste overly minty, but it definitely smells like lemon. I love lemon tea too, it's yummy! I might try this tonight but I have never heard of lemon balm leaves. Where do I find them, in WholeFoods?